The Advanced Post Types Order plugin include an easy way to automatically sort objects of a list (e.g. post type archive, category list, mix of post types and taxonomies terms etc) through a powerful functionality called Automatic Order. This will auto update sort for objects on front site. The Automatic Order usage has been described at Manual / Automatic sorting type usage. Multiple order criteria can be set for the list through the Add Fallback button, which allow to define a new set of criteria, as a pullout method for objects with same order level. This is convenient way to apply a additional sort filter, for items which on a previous pass fall on the same order index. 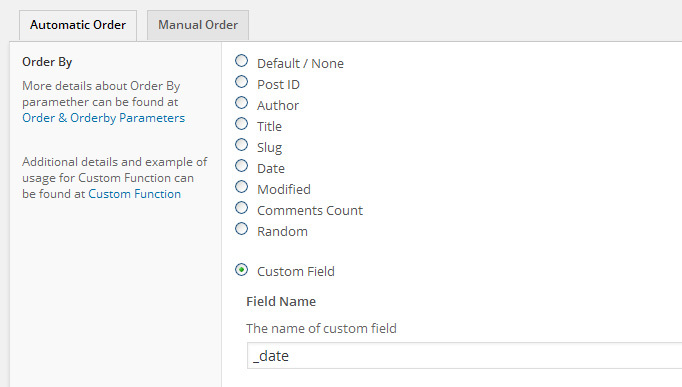 Possible scenario: Using a custom field orderby selection, post objects with the same field value, will be filter using the defined fallback set, which can be another custom field, or a custom function, or default attributes like title, date etc.